The moon base on Icarus was one of many space stations in the system. The main advantage of this station is because of its proximity to the resourceful Imperial planet, Espidus VIII. It could keep watch on the planet below for any enemy movement and respond promptly to any distress call that was given from the planet. When the Xenos and chaos forces suddenly emerged on the Espidus VIII a distress call was sent the Icarus but there was no reply. . . If the base was attacked surely a cry for help would have sent out to the planet below, using radio at least if not astropath. Surely some of the ships would have been able to escape if the station was attacked. Perhaps the base wasn't attacked and there communications are down if so why did the astropaths not send out a message? Failing that why has it taken so long to repair communications? Perhaps there was a minor explosion in a section of the base and that section was subject to the vacuum of space but that wouldn't compromise the whole base only that section. Investigate if the station is still intact. See if there are still Imperial forces on the base. If so find out what happened to the base. Were they attacked and if so by who? Locate any clues that would explain why communications failed i.e. locate the astropaths, there were two of the stationed on Icarus. Check the comms room. See if there are still ships in the hanger. Perhaps the PDF units stationed there have fled using the ships available. There are a number of Oxygen farms located around the station. These provide oxygen to the station and food for the PDF units. See if the plants inside are still alive. There is an autonomous watering system so the plants should still survive even if untended. Due to lack of resources it’s just your team that are investigating this base all other units are being deployed against xenos or chaos threats on Espuidus VIII. The moon has low gravity but your mag-boots should keep you grounded when moving around the station. The oxygen supply might be ruptured so keep your helmets on at all times. Be careful when opening doors not to subject them to the vacuum of space, if your mag-boots are connected to the floor of the base you won’t move but objects inside the room could be projected towards you knock you off your feet. The Deathwatch team alpha VI were dropped into the main hanger of the Icarus Moon base. There was only one remaining Imperial ship left in the hanger as well as two Tau Devilfish. Brother “Devie” formerly of the Dark Angles chapter (Jack), first out of the Thunderhawk transport instinctively scanned the room for enemies and ran over to the far Devilfish to check for hostiles but there were no sign of any. He walked into the open hatch at the rear of the Devilfish up to the cockpit. Next out of the Thunderhawk were “Pucci” (Shane) of the Black Templars and Rudolf (Ailbe) Techmarine of the Iron Hands. They quickly followed their brother to the Devilfish but Pucci “accidentally” locked Devie into the Devilfish. Seeing that his brothers had secured the enemy transports Cameron of the Strom Wardens climbed up the stairs left of the hanger and secured one of the four exits from the hanger. The Techmarine Quitus (Leon) of the Ultramarines and Lexicanum Mortadon (Cormac) of the Carcharadons kept their brothers covered from the exit of the Thunderhawk transport. Devie looking for the controls of the Devilfish accidentally set off a self-destruct sequence and unfortunately in a panic rushed for the closed door, stumbled and fell. Hearing the high pitched bleeping of the Devilfish Rudolf tried to open the door, but to no avail. Quintus ran towards the Devilfish to aid his trapped brother. Cameron unfazed by the difficulty that his brothers were in decided to walk down the corridor of the hanger exit. Devie now in serious trouble with only seconds to get out of the alien craft jumped to his feet, fired his bolter at the hatch, weakening it in a very small area, but doing just enough damage to it so that his when his shoulder met it at full speed the hatch yielded to him and he escaped! However the high pitched bleeping had drawn unwanted attention. Quintus made a routine Auspex sweep. He didn’t see any sign of movement on the auspex. As Cameron ran down the corridor of the hanger exit he came under enemy fire. He skidded on the ground to slow his momentum and to make a smaller target. Rudolf, Pucci and Devie ran and dived away from the Devilfish just before it blew up in a magnificent blue flame, throwing the trio to their feet. At the same moment they also came under fire. Quintus tried to trace where the shots were coming from but they appeared to be materialising out of the air itself. Quintus being a marine well studied in alien technology instantly recognised what this meant. “They’ve got cloaking devices! 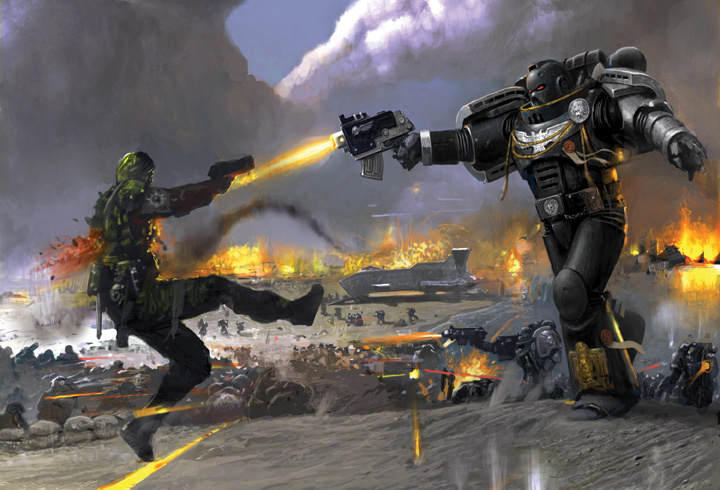 !” he shouted over his vox unit before taking a few pop shoots with his bolter in the general direction of the enemy fire. Mortadon focused his mind, he cut out the sounds of gun shots and the chaos of battle around him. His mind was emptied of the inconsequential thoughts of the mortal mind. He focused his thought on his arm and suddenly a barrier of pure energy surrounded it. Rudolf, Pucci and Devie not knowing where the shots were coming from did not run for cover but instead tried see where the shots were coming from and fire blindly. Rudolf caught a glimpse of light where a single shot seemed to appear. “Got you” Rudolf said to himself. He fired his bolter on full auto at the area where he saw the shot arise, unfortunately the recoil of the bolter throwing off his aim made him miss his target. Pucci and Devie fired blindly in a wide arc hoping at least one shot would make its mark. Cameron now in a stable position fired his gargantuan heavy bolter down the corridor but failed to hit his foe. Realising now that the shots were coming from behind him as he felt a heavy thud against his back. “They’re on the balcony behind me!” Quintus and Mortadon answering the call of their brother fired up towards the balcony but due to lack of vision of were unable to hit the mysterious target. Rudolf could now make out the shimmer of light as it refracted from his foe and could see that it was moving away from him. He called out to his brothers “They’re repositioning towards the back of the hanger!” He fired again at the shimmer of refracted light and found his mark. The bolter shot tore through his enemies armour and bit into his flesh leaving him bleeding. Rudolf could see that his opponent appeared to jump several meters into the air and onto the balcony. He now knew that this was just a hit and run attack to toy with them. “There are escaping through the hanger exit!” he cried. Cameron spun around 180 degrees and fired his heavy bolter. One of the rounds seemed to stop in mid-air before exploding, viciously ripping through the assailant’s armour and discharging his blue blood all around him. The blood spattered on the assailant’s armour and from Cameron’s point of view seemed to float in mid-air. Now he had a target. The wounded foe knowing his peril fled along the balcony out of Cameron’s line of sight. Cameron unrelenting ran back down the corridor after his opponent. Looking left after turning the corner he immediately fired at the levitating blue along the balcony. The force of each miniature explosion tore the adversary’s torso in half, leaving a dismembered wreck of armour, flesh and blood. Cameron noticed the distinct blue flesh of the Xenos scum known as the Tau. Cameron, Mortadon and Quintus intent only on finding more xenos to kill pressed on and found their way to a munitions room but wasn’t impressed by the petty human technology and carried on with their trusty bolters. Pucci and his brothers made their way to the comms room finally they could answer why a distress call was not sent out. Rudolf accessed the communications computers. The transmitting dishes appeared to be offline. Pucci and Rudolf decided to go outside into space and check the dishes to see what was wrong with them. Devie stayed behind to guard the comms room. The first air lock was opened, closed, the room depressurized and the second door was opened to the vacuum of space. Using their magboots the two marines climbed up the side of the base to see that the transmitter dishes had been destroyed by some sort of plasma weapons. There was no hope of repairing the communications system without the necessary parts even for a techmarine as skilled as Rudolf so the two marines came back inside the base. They went out of one of the exits from the comms room leaving Devie again to guard the area. Mortadon, Quintus and Cameron were making their way along the left wing of the moon base when they saw an unsuspecting group of cultist ahead. They unleased a volley of fire on their unlucky foes. Highly explosive bolter and heavy bolter rounds sprayed the chaos fanatics and splattered viscera in every direction. Bodies piled up on the corridor making it even for he cultist to close into melee range due to the fact that they had to dodge bodies as well as firestorm of volatile missile. The cultist didn’t stand a chance and soon. They were eliminated. The marines continued on their path to the generator room. Quintus and his brothers carried on towards the generator room until they came to one of the base’s oxygen farms. The dense shrubbery and foliage blocked them from seeing very clearly into the room. Cameron thought he saw movement through the plants just before bolter rounds started coming from the room. Without delay he fired his heavy bolter at the enemy but heard a click instead of a bang. His weapon jammed. Seeing that his brother was in difficulty Mortadon fearlessly charged at the Chaos space marine in a bout of fury. He activated his force sword and sheathed his arm in pure energy, preparing him for the ensuing combat. His first strike was overly ambitious going straight for his enemies heard which was easily predicted and ducked by the heretic. While rising from dodging the arrogant attack of Mortadon the brought his combat blade attempting to bury the blade deep into the librarians torso but the librarian fuelled by an unnatural battle frenzy pushed the blade aside with his fore arm, which was protected by the energies of the warp. Using the chaos marine’s momentum against him Mortadon swept his blade his foes torso biting through the marines armour and flesh before channelling all of the fury and anger through the blade. The heretic screamed as his flesh was charred his body was disintegrated and he was left a pile of dust inside his ceramite armour. Cameron was trying all the while to unjam his bolter he tried to force the round into place but to no avail he took out the belt feed from the heavy bolter and removed the round jammed between the chamber and the belt feed. The chaos marine saw this easy target an unloaded into the preoccupied marine. The marine sustained damage but nothing that he couldn’t shake off. Quintus engaged the other chaos marine with his bolter his cranially implants aiding his aim he hit the chaos marine a number of times but the heretic’s power armour blocking most of the rounds. However the shots that were able to pierce his armour caused minor explosions to the foe’s chest which ripped out portions of the chaos marine’s flesh and vital organs. The chaos marine still smoking from the heat of the explosions collapsed to the floor. traitor marines: the most hated of all foes! Pucci and Rudolf had stumbled across another oxygen farm on the right wing of the base and unwittingly entered, pushing aside the thick foliage. Rudolf thought he heard a sound behind and turned around and saw a chaos space marine with his combat blade unsheathed lunging for his heart Rudolf unable to react quick enough was able to deflect the blow but it instead hit him felt a knife drive into the side of his torso where his kidney used to be. Rudolf now grappling with the chaos space marine and occupying his two hands used his servo-arm to maim the chaos marine. The servo-arm gripped, and twisted the chaos marine’s shoulder ripping it from its body. The foe fell to the floor in pain where Rudolf drove his combat blade into the heretic’s neck finishing him off. Devie hearing that his brothers needed his aid through his vox unit ran towards the oxygen farm, leaving the comms room unguarded. Pucci hearing the combat was more prepared for an assault and being an assault marine with decades of experience was in his element. He turned, swinging his chainsword in a wide arc which struck his foe in his side and churned his flesh into minced meat. Howling in pain the chaos marine pushed aside Pucci’s chainsword with his own and kicked him to the ground. Pucci stumbling falling to the ground had only milliseconds to react as the chaos marine brought down a vicious heavy strike heading for Pucci’s head. Pucci activated his jump pack projecting several meters along the ground away from his adversary. Using this momentum Pucci kicked off the ground and jumped to his feet. The chaos marine was now running at Pucci at full speed Pucci ran to meet him head, at the last moment before impact Pucci dived and skidded all the while holding out his chainsword which the chaos marine, who hadn’t a chance to react, ran into. The chainsword dismembered the chaos marine’s legs leaving him bleed out in a pool of his own blood. Mortadon, Quintus and Cameron continued to the generator room but when they reached it they could see that the chaos and Tau forces had gone leaving nothing but their dead behind. “They must be escaping with the warp drive.” Quintus said. Pucci and Rudolf ran back to the hanger quickly as they realised that there was still one operational devilfish that the Tau could escape on. Devie ran back to the comms room and could see the chaos forces pursuing the Tau. He laid down an area of supressing fire to split the Tau forces into two. Rudolf was first back into the hanger and could see that there was a group of Tau fire warriors supported by two broadsides. Rudolf aimed at the broadside and in a single round of shooting took him down with a carefully placed headshot. Devie, Mortadon, Quintus and Cameron now had regrouped just outside the hanger with the Chaos forces hot on their heels. Pucci was next back into the hanger and he used his jump pack to propel himself into the fire warriors. He noticed a Tau that didn’t seem like an ordinary fire warrior with a strange device the size of a melta bomb in his hands. He dismembered the Tau making sure not to hit the device and attached it to his mag belt. With the warp device secured he called his brothers to retreat back to the Thunderhawk as there was no chance of destroying the mass chaos forces. The marines ran into the hatch of the Thunderhawk and Quintus performed the fastest take-off he ever performed. The outcome (Campaign-wise) was decided that the Chaos Faction "won" the RPG scenario having been left in control of moon base on Icarus; the Xenos gained nothing - their NPCs having taken an almighty beating & having been prevented from achieving their objective by the players. The Imperial Faction gained an extra advantage in the upcoming Apocalypse Battle - having done not bad; while the Tyranids also got nothing - if all factions had failed in the Scenario then the Tyranid Faction would have won out, with the others all having jointly failed.